Santuario Sisterfarm is committed to the common good of the whole Earth community, understanding that it has taken billions and billions of years of unfolding life for each and every person, creature, plant, and microbe to be present at this precious moment. We honor and celebrate the rich diversity of life as an essential dynamic of the universe and our beloved planet. We comprehend the interconnectedness and interdependence of all life, realizing our essential unity. We see root issues of social injustice and ecological depredation being inextricably linked; they must be addressed holistically. And we see the need to live differently—as if all life depends on it. María Antonietta Berriozábal, President, served on the San Antonio City Council for ten years, working tirelessly on behalf of her community. As a community leader and activist, María continues to serve as an advocate for social justice and is a longtime leader in the struggle to protect the Edwards Aquifer. María has won countless awards in recognition of her work, most recently the newly founded “Sor Juana Achievement Award,” honoring Mexican and Mexican-American women of excellence. Under the Clinton Administration, she served as U.S. Representative to the Inter-American Commission on Women of the Organization of American States and as a U.S. Delegate to the U.N. Fourth World Conference on Women at Mar del Plata, Beijing, and New York. Janie Barrera, MBA, Vice President/Treasurer, is the founding President and CEO of ACCION Texas, now the largest micro-lending organization in the country. Janie has won numerous awards and recognition for her work in addressing poverty through micro-credit strategies, including the 1997 Presidential Award for Excellence in Microenterprise and the prestigious Wachovia NEXT Award for Opportunity Finance in 2007. Janie has been inducted into the San Antonio Women’s Hall of Fame, is active in the Hispanic Chamber of Commerce, and serves on the JP Morgan Chase Bank’s National Community Advisory Board of Directors. In her spare time, she runs “Alma del Río,” a B&B in her historic home across from the San Antonio River (see www.almadelrio.com). Beth Blissman, Ph.D., a Loretto Co-Member, is the Director of the Bonner Center for Service and Learning at Oberlin College in Ohio, where she coordinates support and training for Oberlin College faculty and students interested in academically based community service and community-based research. She also serves as a Lecturer in Oberlin’s Environmental Studies Department. Beth’s academic training is in ecological ethics, and her graduate work at the University of Denver and the Iliff School of Theology led to a dissertation titled, “Toward a Liberation Feminist Ecological Ethic: A Study of the Communal Ethos of the Loretto Earth Network.” Beth formerly served on the staff of the Colorado People's Environmental and Economic Network in Denver, and is currently also on the board of the New Agriarian Center (www.gotthenac.org). Carol Coston, OP, Co-Director, is the founding Director of NETWORK, A National Catholic Social Justice Lobby in Washington, D.C., and founding Director of Partners for the Common Good, an award-winning alternative investment fund that attracted more than $11 million in investments from religious institutes. In 2001, in recognition of a lifetime of service to the common good, Carol received the Presidential Citizens Medal from President Clinton. She also was awarded the Alexandrine Medal from the College of St. Catherine for her leadership and contributions to social justice, women, and economic equity. Carol is the author of numerous articles and chapters in books, as well as of PERMACULTURE: FINDING OUR OWN VINES AND FIG TREES. Elise D. García, OP, Co-Director and Secretary, brings over 20 years of experience in nonprofit fundraising and communications to the board. She served as Vice President of Common Cause, a Washington, D.C.-based citizens lobby, and later as Director of Communications and Development of St. Mary’s University School of Law in San Antonio, where her efforts in behalf of social justice were recognized with the “Santa María Justice Award.” She has served as a consultant to numerous other nonprofit organizations, including Bread for the World, Democracy 21, Mary’s Pence, and NETWORK. As founding Editor of Sor Juana Press, a project of Santuario Sisterfarm, Elise has overseen the publication of seven books. Olga Garza Kauffman was born in Valle Hermoso, Tamaulipas, Mexico, but was raised in the Rio Grande Valley after her family moved there when she was six months old. Her father was a citizen of Mexico and her mother of the United States. Her grandparents, aunts, and uncles, similarly, are citizens of the Texas Borderlands. Olga attended the University of Texas at Austin for two years and later transferred to St. Mary’s University in San Antonio, majoring in Biology. She now considers San Antonio her hometown, having lived there for over 30 years. Olga is a consultant, specializing in grant making and research, community and government affairs, and grassroots organizing. She also works part-time for the Mexican American Unity Council doing development and community affairs work. Actively involved in civic activities throughout her career, which began in pharmaceutical sales, Olga has held leadership positions on various boards including Hispanas Unidas, the Guadalupe Cultural Arts Center, the San Antonio Artist’s Foundation, and Leadership San Antonio. She is a Master Gardener. Married to Al Kauffman, they have two sons, Bernard and Marcos. Patricia Siemen, OP, JD, is the founding Director of the Center for Earth Jurisprudence, a collaborative initiative between Barry University and St. Thomas University in Miami, Florida. Breaking new ground in jurisprudence, the Center is “re-envisioning law and governance from an Earth-centered perspective.” Pat formerly served as the Director of the Earth Ethics Institute of Miami-Dade College where she directed programs on the environment, involving students and faculty on the six campuses of the college system, and on the General Council of the Adrian Dominicans. After earning her law degree from Northeastern School of Law, she worked for the U.S. Department of Justice, Civil Rights Division, and then as a staff attorney for Florida Rural Legal Services. José Victor Fernández, Farm Manager, is responsible for the daily maintenance of the herb and vegetable gardens, orchard, and greenhouse, as well as compost-making and seed-saving. He also is in charge of all building projects and general maintenance, including plumbing, electricity, and irrigation, and oversees the poultry raising. 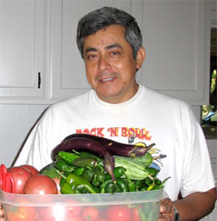 Originally from Eagle Pass, Texas, Victor spent summers as a boy in Mexico caring for his grandmother’s garden. He brings a wide range of experiences—including cabinet making, air conditioner installation and repair, basic electricity and plumbing, as well as general maintenance and landscaping—to Santuario Sisterfarm. Victor and his wife, Monica, are Secretarios of the Movimiento Familiar Cristiano Católico USA, Federación Comfort, Texas, Región 4. Santuario Sisterfarm mourns the loss of Barbara Matteson, OP, who died peacefully on August 13, 2009, after learning, five months earlier, that she had inoperable liver cancer. We remain grateful for her love and support, and count on her continued guidance and blessing. Barbara Matteson, OP, MBA played a leading financial-management role in institutes of women religious for several decades. She was the Founding President of NATRI (National Association for Treasurers of Religious Institutes) and in 2009 completed a term serving as its Executive Director. Prior to this, Barb served as the Finance Director for the Houston Dominicans for 11 years. In addition, she served on the Board of Trustees for the Catholic United Investment Trust of Christian Brothers Investment Services, on the Board of St. Rose Dominican Hospital in Nevada, and as Treasurer of the Dominican Sisters Health Services Consortium. Barb was a former Prioress of the Dominican Sisters of Edmonds, a congregation that merged with the Dominican Sisters of Adrian in 2003.